Last weekend I attended AZ Game Fair 2019 in Mesa. It's just up the road from Tucson, and as a "special guest" I get a free badge, so it's usually a very inexpensive weekend of gaming. However, this year my wife and baby came with, which meant a full price hotel room for 2 nights, so it wasn't so cheap after all. I did not arrive at the convention until 10pm on Friday, so I might as well have just come up Saturday morning and saved the cost of the room that first night... oh well. Saturday and Sunday, however, I did manage to spend a lot of time at the convention, and actually play some games for once! After hopping into a game or two of The Resistance with Sean Ramirez of The Dukes Of Dice podcast, I taught his friends Puerto Rico, which sat at the top of the "best games" list for a decade (and with good reason). Sean and I had played before, so of course it boiled down to a contest between him and me. I haven't played that game in years, but it's definitely one of my favorites, and I pulled out the victory. After that, I was on a game design panel with another local designer, David Short, as well as Canadian special guest Daryl Andrews, and the guest of honor from Italy, Vital Lacerda. The panel was called The Secret Lives of Board Game Designers, but had no real direction or moderator, so I tried to sort of direct traffic. We mostly took questions from the audience. In addition to those old favorites, I got a chance to try a few of the new, hot games. Saturday night Hoss and I sat down to figure out Underwater Cities. The rulebook took about 45 mins to learn from, mostly because they repeated the "play a card and place a worker, and if your card color matches, you get the bonus" text at least 4 times. I was enjoying Underwater Cities while we played, but thinking about it afterwards, I am not sure I'd want to play it more than maybe twice. The "play a card and place a worker, and if your card color matches, you get the bonus" thing is cute. I did feel like I never really wanted to play an off-colored card, even though I had something in play that gave me a consolation prize when I did that (though I probably should have done it once or twice). We had to stop 1 turn before the end because they closed up, so I don't actually know how my strategy turned out, but I got a pretty good feel for it. I saw maybe 2 real paths I'd want to try (the one I did, and 1 other). I'm sure there's more, but it wasn't obvious what else you could really do. The collect-cards-in-play part was a lot like Terraforming Mars, and I definitely liked this A LOT more than I like Terraforming Mars. Wingspan was solid. I enjoyed most of it. Probably the only thing that I thought was weird was the random-and-variable resource pool. You need resources (in 5 types) to pay for playing bird cards, and there's an action where you take some resources (you can upgrade that so you take multiples, 1 at a time). The resource pool is 5 dice, rolled into a supply. When you take a resource, you remove the die from the supply, reducing what's available. Caveat, if all remaining dice in the supply match (there's only 1 resource option available to you), then you may choose to re-roll all of the dice, resetting the whole pool to 5 random things before taking one. I could see wanting a random resource pool, and I could see wanting a competitive resource pool (like dice drafting), but I'm not sure the way they're combined here is the best way to do the job. One of the types of reasons I don't like it is because there are a bunch of card effects that are like "take a [specific resource] from the supply, if it's there" - which is therefore super variable, based not just on what's rolled, but also based on how many dice happen to remain in the supply. Worse, there's a card type that says "when [X happens and succeeds], take a die from the supply," where the likelihood of X happening depends on what opponents do (which is fine), but the likelihood of X succeeding increases as the number of dice remaining decreases... so while it looks like this card gives you flexibility when it hits (you choose a die rather than get a specific resource), in reality, this card is not likely to hit at all, and if it does, you probably get some random resource, not a real choice. I could argue that's just a lame card effect, but I think it's a symptom of a lame resource system. But other than that, I thought the game was fun, and solid. Not as hyped as the previous two games I mentioned, Just One is a hot new cooperative party game where the goal is to get one of your teammates to guess a word by giving 1-word clues. The catch is that after each player writes down their 1-word clue (but before the guesser sees then), any matching clues cancel out. So it's scary to use the obvious clues, because if someone else does that, you don't get them, but then everybody avoids the obvious clues, and you still don't use them! Crusaders came out just a few months ago, and so far it seems to be very well received. The production is very nice, and several people approached me at the convention to tell me how much they were enjoying the game play! One guy who had backed the Deluxified version of the game was trying to read the rules while his friends played another game, so I offered to teach. In the end it was just 2 of them (the other 2 kept playing that other game), so I sat in and made it a 3 player game. It's been a while since I've played Crusaders, but I still liked it a lot! I had made an expansion to Crusaders about a year ago, and I had thought it was probably done. I sent it to Utah with Michael in October so the TMG team could play it, and I just got it back about a week ago. Ben and his daughter were looking to play one of my prototypes, and so as the last game of the convention, I taught them Divine Influence. Emma had not played Crusaders before, but she picked the game up just fine, even with the extra expansion rules. It went well, though I think the free movement from the Influence action is too fiddly, hard to visualize, easy to forget, and usually unnecessary. I should either cut it, or make it simpler -- maybe something like "you may freely move between adjacent hexes with your influence marker on them" (a dynamic known as "railroading" in some games). Maybe better would be to simply cut it, and save having to make components for influence. Late Saturday night I played one of David's quick card game prototypes. It's intended to be a sort of follow up to AEG's Cat Lady. 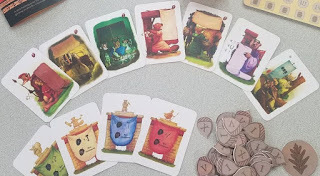 Indeed, much of it was super similar to Cat Lady (collecting similar types of sets from a 3x3 grid), however this game was a step up in complexity, as you could buy upgrades to the patterns of cards you're allowed to pick up. I gave him some feedback, hopefully it was helpful. Mostly it was "once a player replenishes the board, their turn should be over," which I think he agreed with in the end. The rest was about a special card called "fetch," which did something thematic that David liked, but I thought should probably instead just be "get a card from the discard pile," which also seemed thematic to me. The way David wanted to do it, in my mind, subverted the main mechanism in the game, which is something I don't like doing. The recent game Noria does that, and I wish it didn't. Ever since Corbin was born (last summer), I have felt like I've been in a relative famine with regards to playtesting (and gaming in general). I have tried to make up for that with online play at BoardGameArena.com, Boiteajeux.net, Yucata.de, etc. In October, Michael was in town for Rincon, and I manages to get a couple of plays in with him. Then I sent 4 of my prototypes to Utah with him in hopes that they would get played in the TMG office. Finally, after 8 or 9 months off, my playtesting group is back up and running again! This was great news, and it came just in time to finish up last minute development on Eminent Domain Origins, the reboot of my first game, Terra Prime. Now that that's done however, I've run into a problem. All my prototypes are in Utah, what do I test next? Fortunately, I had something. TMG is doing a Deluxified version of Emperor's Choice (I'm in charge of the art direction and rules updating, like I did for Yokohama), and someone suggested we add a 2 player variant to that 3-5 player auction game. So I came up with something, and the last couple of weeks we've been testing that. Yesterday, I came home to a box at my door containing my prototypes! They appear to be in fine condition, and now I've got the opposite problem: which of these should I test next? In addition to that, pretty soon I'll have a version of Worker Learning to test as well! Since Crusaders: Thy Will Be Done arrived a couple of months ago, it seems to be very well received. This makes a perfect window for a Deluxified expansion to go on Kickstarter, along with the opportunity to get the Deluxified base game again, later this year. In anticipation of this, I designed an expansion before my playtesting haiatus, and I'm pretty happy with it so far. Divine Influence adds 4 new building tracks (16 more buildings per player), a revamped (more involved) Influence action, and a few new knight orders to go with them. I posted before about the theme of Deities and Demigods changing to re-imagine Greek mythology in an animals of Africa setting. Art is underway on this one, and I'm a little worried how it will turn out. I think that, like Eminent Domain's title, when players see everything in context, it will work well. This one doesn't really need more testing, unless I want to add that Hades module to the game. Last I checked, with the final tweak to 5p (and maybe 4p) games (everyone starts with 1 tech advance), I think this one is ready to go. It is in line to get art done after the more pressing Divine Influence, which will start as soon as we wrap up art for Eminent Domain Origins which is happening right now (about a month late, which means it probably won't make GenCon, unfortunately). I finally hired an artist and a graphic designer for this age old prototype, though I haven't seen anything from them yet. The game could use some finishing touches, but nothing that would change the major art pieces, so I figured starting art would be ok. There's no deadlude for this one at the moment per se, so maybe starting art now will mean when it comes time, I'll actually make it for once! Right away I had a few course grained suggestions, some of which we implemented on the spot. Others Michael didn't necessarily agree with. He left the game with me to work on, but my testing was on hiatus at the time, so beyond editing the rules to include what I wanted to try, I wasn't able to do anything. Come December, Michael was in town again for the holidays, and I sent his prototype back with him, with my rules edit inside, so they could try it in Utah. I don't think they ever got to it though. Now that I'm playtesting again, I asked for this prototype back, so we could give it some plays. I think I've mentioned that I recruited my friend Rick to help co-design one of my more promising ideas. After some good discussion back and forth, some solo testing on his part, and a couple revisions of the prototype, Rick tells me this game just got its first live playtest! Sounds like it went well, and generated good feedback. Rick will be bringing an updated version to Gamestorm next weekend, and after incorporating that feedback, I'll make a prototype and bring it to my group. I'm excited to see this game in action! But some of the others have a little higher priority, so it might be several weeks before I get to try this one. In the past, I've spent a little time playing online versions of board games, from Puerto Rico on Brettspielwelt.de to Vinci on boiteajeux.net, to Magic: the Gathering on MTG online, but I usually lose interest after a while. I much prefer irl board gaming, face to face with real people. Well, I've been continuing to play games online -- my current makes that much more viable than getting to a live game night. I mostly play 2p games late at night with my friend Steve. I like 2p best, since otherwise it can take a frustratingly long time for my turn to roll around, and I will have forgotten what was going on in the game. Tokaido - another very pleasant, very good game by Antoine Bauza. 2p has a neutral pawn that the player farthest ahead gets to control, which is a really neat aspect. The game is great, but many of the player powers seem lackluster (at least in 2p) because they're so narrow and easily blocked. Still a great game though! And I've started a game of The Castles of Burgundy on boiteajeux.net with Steve. I like that game, but when I play it in real life I feel like it takes too long. I'd REALLY like the game if it only took an hour, but it consistently takes 2 hours when playing with 4 players. So maybe it's better online? So far, yes and no. It's nice to log in, think about your turn, and do it... but it's real easy for me to ignore my opponent and play solitaire that way, which has hurt me in this game. Also, just like irl, the game has the dice luck that can really be annoying sometimes. I'm having a lot of fun playing these games online, though it'll never be as good as playing in real life. It's especially fun to play and chat in real time, though with my schedule I can never commit to actual real time games, just turn based ones where we take our turns in quick succession for a while. Today I got a couple more "last minute" tests of Eminent Domain Origins in, one 4-player (using the 2-5p starting cards), and one 2p (turns out I hadn't tested 2p since making all these updates and changes). In the 4p game, Dan joined Dave, Jesse, and me. He played the game once about a year ago, so was basically a new player, so I asked him to just play normally and let me know what was fiddly, odd, hard to understand, or easy to forget. Dave and Jesse each tried the new 4-5p starting cards (Jesse started with a colony marker loaded, an energy, and $10; Dave started with 2 crystal and an energy). I decided to try alien hunting, since I hadn't seen it much lately, and so started with a weapon and a crystal. I gave Dan a basic $30 starting card. In the end, the game was quite close, with Dave winning out 60-50-50-49. I may have missed a round or two, but I counted 17 rounds -- I thought I remembered Terra Prime lasting more like 20-24 or so. Jump starting the game a little bit by giving players starting resources and cutting the phase 1 reward cards, and allowing colony spots (planets) to exist in adjacent sectors, may have sped the game up a little bit, but I DID add 3 tiles to the phase III rewards, so we were only really net down 1 reward tile total. It's likely players just did more scoring actions (colonizing and defeating aliens) than what sometimes happens so the game was on the short end. Dave's winning 60 points came on the back of quite a lot of delivering. He used his 2 crystal start to quickly (turn 4 or 5) get a Matter Converter, and soon after delivered a bunch of cubes for a fistful of credits and bought 2 Thrusters in one turn. Dave is usually partial to Afterburners, but I guess he decided he didn't have the energy economy for it this time. In any case, he had 5 actions while the rest of us ad only 3 for a while. Dan and Jesse eventually got Thrusters of their own, for some reason I didn't bother, which may have been my downfall. The verdict on the starting card is that it's probably fine. The verdict on Matter Converter is that it's potentially very strong, probably not a problem, but might ought to be worded such that you still have to carry the correct cubes according to your holds, and then deliver/upgrade as if they're wild, rather than letting you convert them to whatever you want whenever you want, which just encourages you to visit your own places. Jesse's downfall may have been poor rolls combined with potentially ill advised pathing. He kept crashing into asteroids, and hadn't bought shields first. This cost him 3vp on more than 1 occasion. Had he just rolled a little better (or spent the action and $20 to get and charge shields), he could have been neck and neck with Dave in the end. Never mind that one of the collisions cost him an engine, about 1/2 way through the game, putting him out maybe 7 or 8 actions! However, his start was strong, Starting with a loaded colony marker was pretty great, it allowed him to usurp a colony spot from player 1 (Dan, who might have been better off doing something a little bit different), and as Jesse pointed out, irrespective of turn order, starting with a loaded colony means that he's the ONLY player who could colonize 2 spaces from TP on turn 1. It also means that players earlier in turn order have to be a bit more careful and hedge their bets if they're not colonizing on turn 1, lest their colony get sniped. That's probably OK, but we decided to take away the energy, so that if there's an asteroid in the way, at least you have to risk losing 3 points to do that. I tried to do some alien hunting, and I did an alright job, my big errors were getting an early Battle Station instead of selling cubes to afford a Thruster, and not setting up any accessible early game colonies for other players to use. The only planet 1 step from TP was a green one off to one side, and since Dan didn't take it, I decided to colonize it on turn 1. Nobody used it all game, and I didn't drop any colonies in high traffic areas, so I didn't get to leach any points off of other players. Any way you look at it, that score was pretty darn close all around. After Dan left, I mentioned the board scaling for 2 players (2 fewer tiles in each row, and only 1 of each tech upgrade), and it occurred to me that I hadn't played 2p in this new version of the game. So I had Jesse and Dave play 2p while I watched. They ended up choosing the sort of standard $20 and $30 for starting resources, and while I lost count half way through the game, I'm pretty sure it lasted about 20 rounds -- just a few more than the 4 player game. I noticed that in the mid-game, both players spent time upgrading their ship rather than dropping colonies or killing aliens, which dragged the game out a little bit, but also was fun for the players to really pursue a strategy. Dave ended up with a Thruster and 2 Afterburners (with Additional Module Slots), so was doing 8 actions per turn. Jesse had 2 Thrusters for 5 actions per turn. Both geared up for alien hunting, but neither did a whole lot of it until the end of the game. Between the two of them, they explored every tile, but they also left a lot of maybe lower scoring colony spaces alone... had either of them grabbed a Cryo Chamber (or Cargo upgrade) and started dropping multiple colonies per trip, the game could have been considerably shorter (on par with the 4p game perhaps). The verdict was that the 2p game seemed fine. I think we don't need to do any further scaling such as removing any reward cards. It felt like the game dragged a little, but that was because (a) players drew it out a bit, and (b) Dave's turns started taking incredibly long as he hemmed and hawed over planning out his 8 actions! All in all, I think it was a fine test day. I made a tweak to one of the starting cards (take the energy off the loaded colony marker one), and I might tweak the wording on Matter Converter. I might also add a reward card or two (probably double up on existing ones) just to make sure there's enough time in a 5 player game for players' strategies to develop. Deities & Demigods face lift - need a new title! Oh, boy, I keep hearing people use the term "trope" like it's a negative. So let's talk about tropes and cliches. The chibi style is cute, and works very well for that game, but (a) I'm not sure that kind of style would work as well for Deities & Demigods, and (b) it's been done already! 1. Allocate a large art budget, so that if the game had to look like other, similar games, maybe it could look better. However, looking at some of the Greek mythology art from recent games, it appears they've already done that! 2. Change pantheons, moving from Greek mythology to something less commonly used, such as Egyptian mythology. For a while I thought this would be the right decision, as the art could look different, and people could comment on the unusual theme rather than the same-old same-old of the overused Greek setting. But the more I thought about it, the more I realized that while the outfits would look different, the artwork would still probably look similar to the Greek games, and I wasn't finding Egyptian gods that fit as well with the game action. 3. 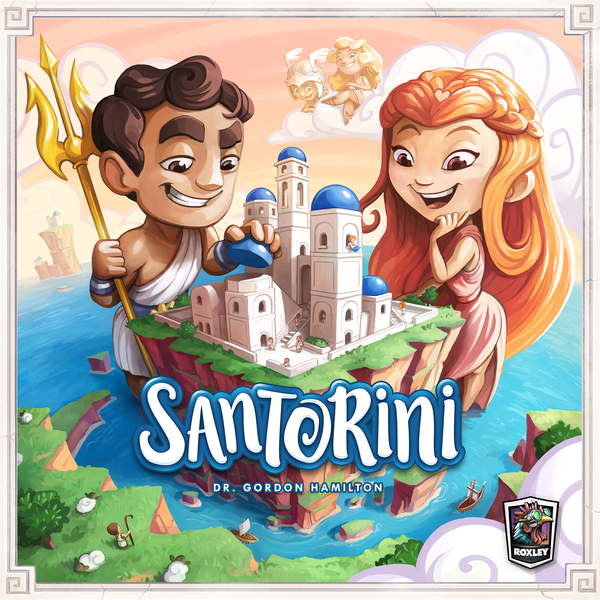 Find a new style, like Santorini did. I came across the art for SPQF in the portfolio of one of the artists I was considering, and it got me thinking. SPQF is a card based civilization building game, with very nice art of anthropomorphic animals. There have been a couple other games with anthropomorphized animals lately -- one might even say it's the start of a trend, however I don't think we're there yet. This led me to consider a cross between Clash of the Titans and The Lion King... what if we re-imagined the Greek pantheon as animals of the African plain? In the end, I liked the sound of this third option best, and have decided to go that route -- re-imagining the pantheon as anthropomorphic animals. This allows us to keep the tropes of Greek mythology, but use art that differs significantly from other Greek themed games, and could look pretty cool. With a change of theme, a few details will have to change as well. For example, animals have no use for gold, so perhaps food would be a better thing with which to show devotion. That said, perhaps Artemis (goddess of the hunt) would make more sense than Hermes, and as an added bonus it would get more goddesses into the game (something I'd been wanting to do anyway). To represent Artemis, perhaps a bird of prey would make sense. For the player boards, I figure smaller animals would make sense, something like meerkats, gazelles, monkeys, and I don't know, some bird species perhaps. These are animals that are found in packs or groups, so it would make sense that you have 12 of them under your control. To represent your troops on the board, a regular meeple doesn't really evoke animals, so I've been thinking of something better. One thought is a sort of generic "animeeple" -- a 4 legged something-or-other which is not necessarily related to any of the player boards. The graphic designer suggested a paw shape, which could be cute, and would stack well, but might not be as fun for players to move around the board. I'm open to suggestions for a meeple shape that would be good. I don't think it can really relate to the player board animals, or else (a) the player who insists on playing red all the time would always have to be meerkats, and (b) if we add more player boards with player powers in an expansion or something, we'd have to add 12 meeples to go with it! Deities and Demigods was a title I was kind of OK with, but it was always only a placeholder. 90% of the people who play the game point out that there's an old Dungeons and Dragons sourcebook with that title, which I don't actually think matters. In any case, I've always wanted a better title. However, now that the game is about animals in the African plains or Savannah, I don't think any of those would really work anyway. I could really use a title for this game, and the sooner the better so the graphic designer can make a logo for it! Please comment with your suggestions. I wanted to test the 4-5p starting resources, but there were only three of us. Dave has played a handful of games (last year), while Hoss hadn't played at all. I wanted feedback from fresh eyes on the game in general from Hoss (mostly about fiddliness and grokability), but had Dave and myself each play 2 seats so we could see the 4-5p starting cards in action. Dave had the Afterburner to see if he could abuse it. I had the Upgraded Cargo Hold to see if it felt way too good. In the end, the 5th player (Upgraded Cargo Hold) won, but I don't think it was really due to the starting resources. In fact, I felt like I kind of squandered my start, but that seat just played a good game otherwise. Dave tried to get the Afterburner online as quickly as possible in seat 4. He ended up in 2nd place by only 6 points. Only two points back was Dave's other seat (P1), who started with $20 and tried avoiding buying a thruster (he got a Hyperdrive). Russell showed up right at the end of that first game,so next we played with 4, but to test more if the 4-5p cards, we just skipped the 1p ones. Hoss and I started with 2-3p cards cryo Chamber and Weapon+Crystal, respectivly). Dave starter with the Upgraded Cargo Hold and Russell started with Additional Module Slots+$20. Hoss, still a newbie, didn't do great. He was doing better until a pretty devastating mistake - he left the Outpost to Colonize but forgot a colony marker! I worry a little bit that this may be a common error, but other than warm about it in the rules, I don't think there's anything I can really do about it witjwit making significant changes to the system :/ I did about as badly as Hoss, just taking way too long to actually put my plans into action. But more importantly, how did the 4th and 5th players do with their starting resources? We'll, Russell had a pretty strong showing, getting 2nd place without ever using the Additional Module Slots. Though all three of us were close packed in score. Dave however finished 25 points ahead... Which is like 2-3 big plays in this game. How much of this was due to the Upgraded Cargo Hold? We'll, probably at least 10 of it was from capitalizing on Hoss' mistakes, but he was also able to do a lot with the ability to hold both 2 colony markers and so many resources. In the end, the Upgraded Cargo Hold is probably overpowered, and the Additional Module Slots is probably underpowered. That technologhy just isn't a "starting resource," and as such is not a useful thing to get at the beginning of the game. I'm going to try "$10+1 Energy+loaded colony marker" and "2 brown + 1 energy" instead of those two starting cards. Also, originally each player started with 3 VP, in case you ran into an asteroid in the early game and didn't have shields. I've been trying the game without that, but I realized today that starting with 1 energy is irrelevant if you have nothing to lose by crashing into asteroids. So I think I'll add VP to all of the cards so that starting with 1 energy is relevant again. I think most of the cards will get 3vp, but I can tune up or down for cards that feel a little strong or weak. With the inclusion of the starting resource cards, I have deleted the stage 1 rewards, because they served the same purpose. This shortens the game a little bit, but I did add 3 tiles to stage 3, so it should not be too different than the old version. However, one of the stage 3 rewards is a free Thruster module, which is great (better the earlier you get it), but comes out fairly late, so there isn't much time to use it. But without the stage 1 rewards, that one can come out all the earlier, which may be too strong. I might move that one to stage 4 instead. As for the Wormhole physics I talked about last time, I worry that "any OTHER wormhole" will be one of those easily forgotten rules. I guess the game doesn't break if players go in and out of the same wormhole, I've been playing that way. But should I have an easier to remember rule? Yesterday we tried a tweak on that rule: "Use 1 action to move into a wormhole and then out of any OTHER wormhole." This meant that the first wormhole (which will now be in the center of the green zone every game) doesn't really do anything at all, until a 2nd one is found. No more jumping over a hex, or using that starting wormhole to dart out into deep space! This seemed to work well, and made the wormholes behave like I'd intended -- in the midgame they start shrinking the board. So in an effort to do some house cleaning, I decided to try removing that portion of he turn. Instead, I've simply said you can always pick up a resource at a colony, and just limited that action to 1x/colony/turn. That way there's no need to explain production, no chance to forget to do it, and the board is a bit less cluttered. It's been over a year since my last post about Eminent Domain Origins, and one of the last things I was trying out was a starting resource draft. Inspired by Mark Major's Chimera Station, I thought it could be fun to mix up the starting resources in the game by drafting starting resource cards. Rather than draft them in reverse turn order though, I decided to make a subset of cards for 1st player, 2nd-3rd player, and 4th-5th player, and deal out 2 of those cards to each player based on their turn order. You can choose one of the two for your starting resources. An Upgraded Cargo Hold sounds potentially problematic as well, but I doubt it will turn out to be overpowered either. I hadn't thought of this before, but I like the idea of it better than what I had originally written (Cargo Hold + 10 credits, and Cryo Chamber + 10 credits). Because of early turn order advantage (dibs on the early game colonies nearby the Terra Prime space station, and potentially 1 more turn over the course of the game), the starting resource cards scale up for later turn order players. I am certain that turn order advantage early in the game, and unequal turns at the end, are the types of things players will key into, and therefore turn order compensation is warranted. One thing players don't necessarily notice as often is the inherent DISadvantage for early turn players in a game where you don't know for sure whether you'll get another turn, which is the case here as well. Between this inherent disadvantage, the partial credit for resources and colony markers on your ship at game end, and the turn order compensation, I figure the game is (and looks) well balanced enough that no particular turn order is really advantaged over another. One of the things I didn't like about the new exploration tiles was that in the Green zone, most of them are blank. It's not fun to "explore" an area, flip up a tile, and find nothing. Last year my notes suggest I was considering putting weak hazards, like single asteroids, or even boons, like pieces of crystal (fka brownium) for players to find. However, that exacerbates any early turn order advantage. And while it may be neat to find a wormhole right outside the door of the space station, when that happens it really distorts the map, making that entrance much more heavily traveled, and with it, the player(s) whose early colonies are on that side of the board are more heavily used. I thought of an alternative, and tried it out yesterday... I can just GET RID of the green exploration tiles altogether! Instead, I can just have 1 tile with a wormhole that gets placed on the center green hex (the only one without a direct route to Terra Prime). To be honest, this doesn't really reduce setup very much, you still need to lay out the space hexes, and put exploration tiles on the yellow and red ones. However, it makes the game a little less fiddly (no flipping tiles to reveal nothing), and a little more consistent with the standard placement of the wormhole. Speaking of wormholes, I'd originally used a rule that for 1 move action, you could move into a wormhole, and for another move action, you could move out of ANY wormhole on the board. A few key points about this was that it required a MOVE action, not an EXPLORE action, so players could not legally exit a wormhole at a sector with 2 face down tiles. This maintained a dynamic wherein you NEVER could be in a situation where you were flipping 2 tiles at once. To be honest, I kind of liked that rule, but it did lead to a little bit of confusion at times, and players frequently conflated MOVE and EXPLORE actions, and therefore asked about flipping 2 tiles at once coming out of a wormhole. David Short insisted that while you shouldn't be able to flip 2 tiles at once, you SHOULD be able to flip 1 when coming out of a wormhole, which he held was consistent with a turn where you weren't coming out of a wormhole... that would translate to the rule "you can move or explore out of a wormhole, but not to a sector with 2 face down tiles." I did not agree that that was more consistent (I didn't like the exception clause), but it definitely made clear that some people would try to do that. A year ago, I decided to simplify the game by basically combining MOVE and EXPLORE into the same action. No more limit of 1 Explore per turn, if you move into a sector with a face down tile, you simply flip it up. This sped the game up a bit, and didn't really harm it any, but it brought up the issue of flipping 2 tiles at once coming out of a wormhole... I decided to try allowing that, and so far it hasn't really been a problem. Exploring comes with it's own risks (encountering aliens or asteroids) anyway. The question is bound to come up: "in what order do you resolve the tiles?" -- I will probably say in the rulebook that you flip them over and resolve them one at a time, however in reality, I don't think there's ever a conflict. Undoubtedly, someone will ask "what if I flip an alien and an asteroid at the same time?" But that's actually already answered if you play the rules as written: When revealing a stray asteroid, you immediately roll to evade them. When revealing aliens you do nothing immediately. At the end of the action, if you are adjacent to aliens, then they attack you. Even though this is clearly defined in the rules already, I will likely address it specifically, perhaps in an example, because I've learned that people have a tendency to conflate or misinterpret rules. Another change I made at that time was to allow movement into and then out of a wormhole in the same action. This was to speed things up a little bit, and to avoid questions involving ships being "in wormholes" as opposed to in sectors, where they usually are. The rule was"Use 1 action to move into a wormhole and then out of any wormhole." This meant you could traverse a hex (from one corner to the opposite corner) with a wormhole in it for 1 action instead of spending 3 actions moving around the outside edge. It also meant you could jump pretty deep into space with only 1 wormhole on the board, and I had just implemented a permanent wormhole on the green zone (rather than a probable one, which could be off to one side of the board). That's not really what the wormholes were meant to do -- I wanted them to sort of shrink the board once it had been explored a bit. In Terra Prime, the first thing you do on your turn is make sure there is a resource cube at each of your colonies. If there isn't one there, you produce one. If there is, you do nothing. This way, there's only at most 1 resource at each colony, making a little bit of a race to pick them up, however you can be sure hat your own colonies will always have resources available for you on your turn. I liked that dynamic, and it was one of the points of interaction in the game (if I go after you, and I want your Green resource, you can always take it from me... which means I might have to stall or change my plans if I think you'll snake the resource I want). It was also one of the easiest things to forget in the game... your turn rolls around, and you start doing your stuff, forgetting to produce resources. It was very common, even among veteran players. It also wasn't a big deal to forget, because it was very easy to figure out at any given time whether a colony ought to have a resource on it (it would have produced on your turn, and neither you or she picked it up, so it should be there for me now). Another issue with the production rule is when teaching the game, the first thing you say is "on your turn, you first produce a resource at each of your colonies..." only players don't know what a colony even IS yet, or how to get them! That's always been kind of sub-par.